It is a pleasure to cook a light Sunday lunch while listening to Shiela on the BBC food programme at noon. But last Sunday was rather surreal as I was cooking a bean stew while Shiela and her guests were discussing how to introduce pulses and beans into the British diet. While the British eat copious amount of baked beans for breakfast they do shy away from beans and pulses in their main meals. Worries around toxicity, amount of time to cook a bean stop people from incorporating in their diet and the programme was trying to address those myths. There is also a stigma of poverty attached to pulses and nobody wants to be seen as a moong munching socialist. While listening to their discussion I was reminded of a chat I had with my mother a long time ago. On one summer holiday I walked into the kitchen in search of a snack. My mother was chatting to the lady who helped her in the kitchen. My mother like Doris Lessing always had long heart to heart talks with the women who over the years have helped her in the household work. Ok I have to confess that I like most children adore my mother and am biased towards her and firmly believe that she could have been Doris Lessing if she wanted to. Anyway on that day they were talking about the lady’s child who was recovering from a recent illness. My mother was suggesting that he should have some milk and egg and was offering her a boiled egg on her way home. I had just studied about pulses, plant protein, nitrogen fixation in my biology class and could not wait to show off my knowledge. “Everybody should have a cup of daal everyday” – I said – “They are an excellent source of protein”. My mother mildly agreed to my suggestion gave me a cashew and two raisins ( more about that later) and asked me to run along. Later in the day she gave me a lesson in life. She explained to me that people with low earnings mostly cannot afford to eat daal as they take up a lot of fuel to cook and they cannot invest in a pressure cooker. It was my “Let them eat cake” moment. Over the years pulses have become even less affordable to a large section of Indian population. Hence whenever I hear someone say that pulses are a cheap source of protein I remind myself that that it is all a matter of perspective. 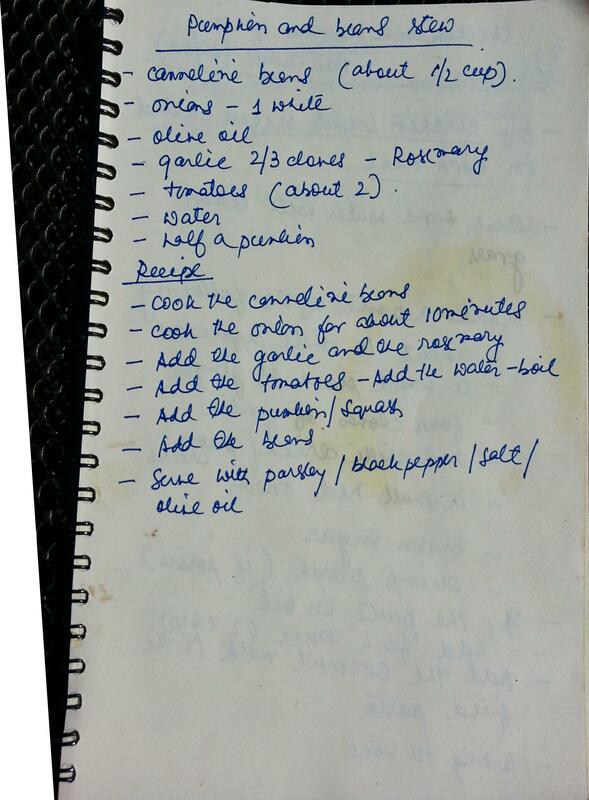 The recipe I was cooking that day was simple pumpkin and bean recipe. 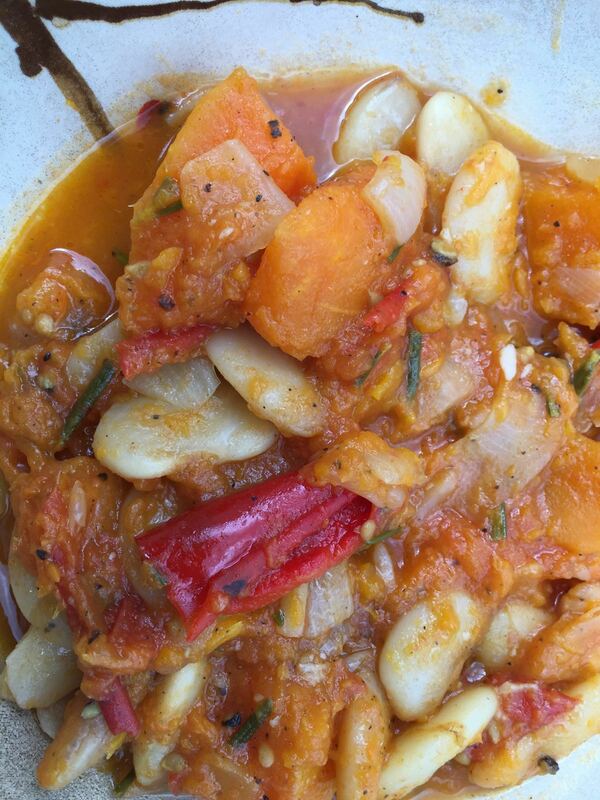 I had some roasted onion squash which I used along with butter beans and some red pepper. The recipe is a office lens of the written notebook. This entry was tagged butter bean, roasted pumpkin, stew, vegetarian. Bookmark the permalink.